Includes: AC72 alligator clips, stackable test leads, TL 75 testleads, User manuals and NIST- traceable calibration report and data. 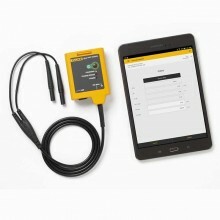 The Fluke 726 Precision Multifunction Process Calibrator is designed specifically for the Process industry with broad workload coverage, calibration power and unsurpassed accuracy in mind. 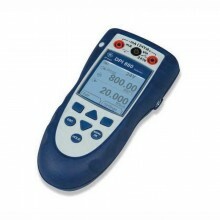 The 726 measures and sources almost all process parameters and can calibrate almost anything. 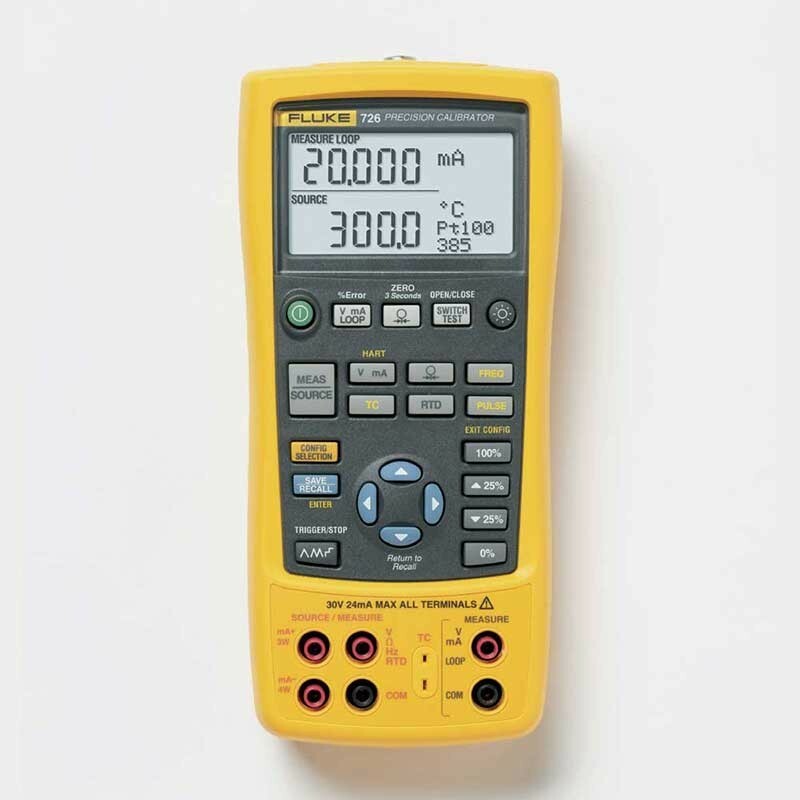 The Fluke 726 delivers accuracies of 0.01 percent, and measures and sources key process parameters including volts, mA, RTDs, thermocouples, frequency, resistance and pressure. 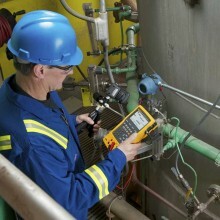 Measure, source and view process signals simultaneously. 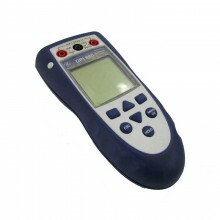 Measure volts, mA, RTDs, thermocouples, frequency & resistance. Source/simulate volts, mA, thermocouples, RTDs, frequency & pressure. Memory storage for up to 8 calibration results. 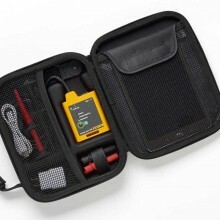 HART mode inserts 250Ω resistor in mA measure and source for compatibility with HART instrumentation. Store frequently-used test setups for later use. 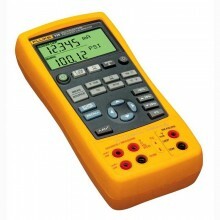 Voltage DC 30.000 V 0.01% + 2 mV (upper display). 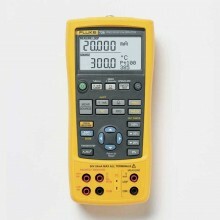 20.000 V 0.01% + 2 mV (lower display). 90.00 mV 0.01% + 10 μV. -10.00 mV to 75.00 mV 0.025% + 1 count (via TC connector). Current DC 24.000 mA 0.01%+ 2 mA. Resistance 0.0 to 4000.0 Ω ± 0.015%. Frequency 2.0 to 1000.0 CPM 0.05% + 0.1 cpm. 1.0 to 1000.0 Hz 0.05% + 0.1 Hz. 1.00 to 15.00 kHz 0.05% + 0.01 kHz. Accuracy from 0.025% of range using any of 29 pressure modules (for detailed specifications refer to pressure modules in options and accessories). Modules available for differential, gauge, vacuum, absolute, dual and high pressure. 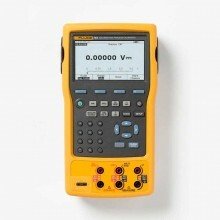 Voltage DC 100.00 mV 0.01% + 10 μV. 20.000 V 0.01% + 2 mV. Current DC 24.000 mA (Source) 0.01% + 2 μA. 24.000 mA (Simulate) 0.01% + 2 μA. 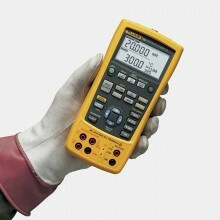 Resistance Range, accuracy (percent of reading + floor) and excitation current 5 to 400 Ω, 0.015% + 0.1 Ω, 0.1 to 0.5 mA. 5 to 400 Ω, 0.015% + 0.05 Ω, 0.5 to 3 mA. 400 to 1500 Ω, 0.015% + 0.5 Ω, 0.05 to 0.8 mA. 1500 to 4000 Ω, 0.015% + 0.5 Ω, 0.05 to 0.4 mA. Frequency 2.0 to 1000.0 CPM 0.05%. 1.0 to 1000.0 Hz 0.05%. 1.0 to 10.0 kHz 0.25%. 10.0 to 15.0 kHz 0.5%. Waveform 5 V p-p squarewave, -0.1 V offset. 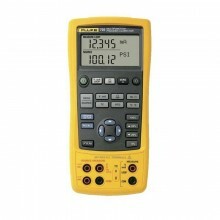 Measure and source accuracy Cu10 1.8°C. TC Resolution J, K, T, E, L, N, U: 0.1°C, 0.1°F B, R, S: 1°C, 1°F. 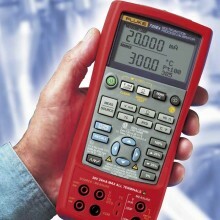 Ramp functions Source functions Voltage, current, resistance, frequency, temperature. Ramps Slow ramp, Fast ramp, 25% step-ramp. Loop power function Voltage 24 V.
Maximum current 22 mA, short circuit protected. 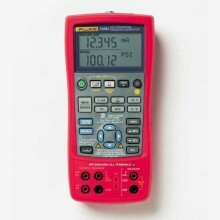 Step functions Source functions Voltage, current, resistance, frequency, temperature. Steps 25% of range, 100% of range. Operating temperature -10°C to +55°C. Storage temperature -20°C to +71°C. Agency approvals EN 61010-1:1993, ANSI/ISA S82.01-1994; CAN/CSA C22.2 No 1010.1:1992. Size 200 x 96 x 47 mm (7.9 x 3.8 x 1.9 in). Weight 650 g (23 oz). Batteries 4 AA alkaline batteries. Battery replacement Separate battery compartment, accessible without breaking calibration seal. Side port connections Pressure module connector, also used for remote real-time programming. 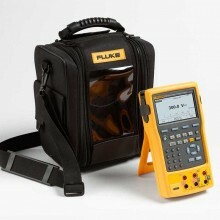 PDF Specifications of the Fluke 726 Precision Multifunction Calibrator.